CBD-rich hempseed is legal now, but it’s also rare, giving plant breeders a huge new market as barriers to national hempseed distribution are removed. The 2018 Farm Bill guarantees interstate commerce for all hemp products, removing requirements that viable hempseeds require approval from the U.S. Drug Enforcement Administration. 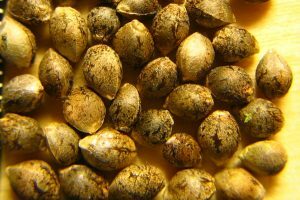 But the law leaves in place requirements in more than a dozen states around certified seeds – those that have been tested against germination and uniformity benchmarks and show low levels of THC. Cannabis varieties that contain more than 0.3% THC remain illegal under the 2018 Farm Bill. The timing couldn’t be better for seed breeders such as Jen Van Den Berg of Hotchkiss, Colorado, whose Mountain Mother cultivar was certified Monday by the Colorado Department of Agriculture. The variety is guaranteed to come in at roughly 6% CBD if grown from seed and higher if grown indoors. “It’s a sales advantage to have the certification,” said Van Den Berg, owner of Mountain Flower Botanicals, which grows hemp on 66 acres and sells wholesale CBD extract. Many hemp variants currently being grown are imported from the European Union – cultivars that are generally bred for fiber and seed production, not CBD-rich flowers. Van Den Berg said time spent crafting a certified variety is worth it, because certified seeds guaranteed to produce those CBD-rich flowers are so rare that genetics could prove more profitable than selling hemp outright. She spent eight hemp generations – more than two years – perfecting her variety. Van Den Berg predicted a flood of low-CBD hemp varieties coming from the EU in the coming months. “They have never grown for CBD over there. They don’t have strains over about 3% CBD,” she said. Colorado now has 13 certified hemp cultivars, the most of any state. The Farm Bill doesn’t address hemp farmers who have already been buying and selling hemp cultivars. A West Virginia hemp farm was ordered to close last year after it was accused of illegally importing hempseeds from Kentucky; that case is pending. We have all the seed you need! Great information on the latest in CBD seeds and the European varieties just coming to the U.S.. I am interested in developing hemp seeds in my existing Greenhouses in Santa Barbara. It only makes sense that hemp cultivars will be bred for certain micro climates. What can you add to this comment ? 6% CBD what a joke, it’s way too low. Regardless of the certification you’d be lucky to sell that garbage at a bargain basement price. Do your research. Weekly Hemp Industry News Delivered Right to Your Inbox!